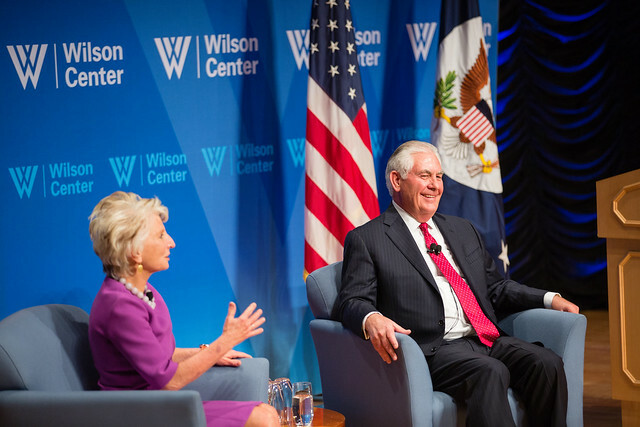 Address by U.S. Secretary of State Rex Tillerson: "The U.S. And Europe: Strengthening Western Alliances"
In a wide-ranging address and question-and-answer session, U.S. Secretary of State Rex Tillerson pledged continued U.S. commitment to European security, while describing "strategic policy shifts"; denounced Russia’s “malicious tactics” in the West; and responded to criticism about changes at the State Department. The secretary also touched upon Turkey, the Balkans, Brexit, the threat of terrorism, and more. "Our security commitments to European allies are ironclad." "Over the past 10 months, we have embarked on new strategic policy shifts that bolster European and American security -- namely, a recommitment to Europe in the wake of the failed “Russia reset"; a new effort to adapt security institutions to combat emerging threats like terrorism, cyberattacks, and nuclear proliferation; and an expectation that European nations accept they are more secure when they contribute more toward their own defense." "Our expenditures are, in some ways, a reflection of how much we seek to protect peace and freedom. We once again urge European partners who have not done so already to meet the two percent of GDP target for defense spending." "It’s a recommitment, but it’s also a redefinition of what this alliance means. The message President Trump carried early on when he went to Europe, and received a lot of criticism for it, was to demand of our allies that you care as much about your freedom and you care as much about the security of your people as we care about you." "Russia continues its aggressive behavior toward other regional neighbors by interfering in election processes and promoting non-democratic ideals. We, together with our friends in Europe, recognize the active threat of a recently resurgent Russia." "In view of Russia’s Zapad military exercises conducted near the borders of Baltic States in September, our ability to respond to an attack in concert with our allies is more important than ever." "Russia has often employed malicious tactics against the U.S. and Europe to drive us apart, weaken our confidence, and undermine the political and economic successes that we have achieved together since the end of the Cold War. Playing politics with energy supplies, launching cyber attacks and disinformation campaigns to undermine free elections, and serially harassing and intimidating diplomats are not the behaviors of a responsible nation." "Russia can continue to isolate and impoverish itself by sowing disorder abroad and impeding liberty at home, or it can become a force that will advance the freedom of Russians and the stability of Eurasia." "We’re working hard [with Russia] in Syria to defeat ISIS and we’re on the cusp of having ISIS once and for all defeated in Syria. We’ve got work yet to do. And we’re working hard with Russia on how to prevent the civil war from re-erupting." "Let me be clear: Minsk-related sanctions will remain in place until Russia reverses the actions that triggered them." "Ukraine’s future depends also on winning its internal struggle to implement a broad range of economic, justice, security, and social sector reforms. We encourage Ukraine to continue building capable, trustworthy institutions that will reduce and eventually eliminate corruption." "The United States will continue to support European infrastructure projects... to ensure that no country from outside Europe’s Energy Union can use its resources or its position in the global energy market to extort other nations." "We continue to view the development of pipelines like Nord Stream 2 and the multi-line Turkstream as unwise, as they only increase market dominance from a single supplier to Europe." "To the people of the Balkan countries, we say: abandon old animosities so that peace may become permanent. You have a chance to direct a new course of history. Bloodlines should no longer be battle lines." "The United States and the world long to see a new generation of Serbs, Croatians, Albanians, Bosnians, Kosovars, and others who will forgive the past, even if they cannot forget it." "The JCPOA is no longer the only point of U.S. policy toward Iran. We are committed to addressing the totality of the Iranian threat. We ask our European partners to join us in standing up to all of Iran’s malign behavior." "We ask Turkey, as a NATO ally, to prioritize the common defense of its treaty allies. Iran and Russia cannot offer the Turkish people the economic and political benefits that membership in the Western community of nations can provide." "We must take action so that areas like the Sahel or the Maghreb do not become the next breeding ground for ISIS, al-Qaeda, or other terrorist groups." "Our fight is increasingly located on the internet, at passport checkpoints, and in the hearts and minds of young people in Europe and around the globe." "We will not attempt to influence the negotiations, but we urge the EU and UK to move this process forward swiftly and without unnecessary acrimony." "There is no hollowing out. These numbers that people are throwing around are just false. They’re wrong." "The Arctic is important today and it’s going to be increasingly important in the future, particularly as those waterways have opened up. What I can tell you is [that] the United States is behind… We’re behind all the other Arctic nations… We’re late to the game." For the full transcript, click here.